Île aux Cerfs Island is named as such due to the presence of deer on the island long time back. It is located near the eastern coast of Mauritius. This famous Destination Island spans about 100 hectares of land. There are no more deer nowadays, but you will find some of the most beautiful beaches in the world. Ile Aux Cerfs is known for its beautiful white sandy beaches, beautiful lagoons and a wide selection of facilities and activities. You’re sure to have a day of fun and relaxation as you enjoy swimming, snorkeling and parasailing at Ile-aux-cerfs. How To Get To Ile Aux Cerfs? You can get to the Ile Aux Cerfs by catamaran, speedboat or even yacht. We highly recommend that you take organized tours rather going on your own. The price of these tours is much cheaper compared to traveling by yourself. Other than the money, these packages will also save you the hassle and time, and allow you to relax, have fun and enjoy your tour knowing that all arrangements have been taken care of. 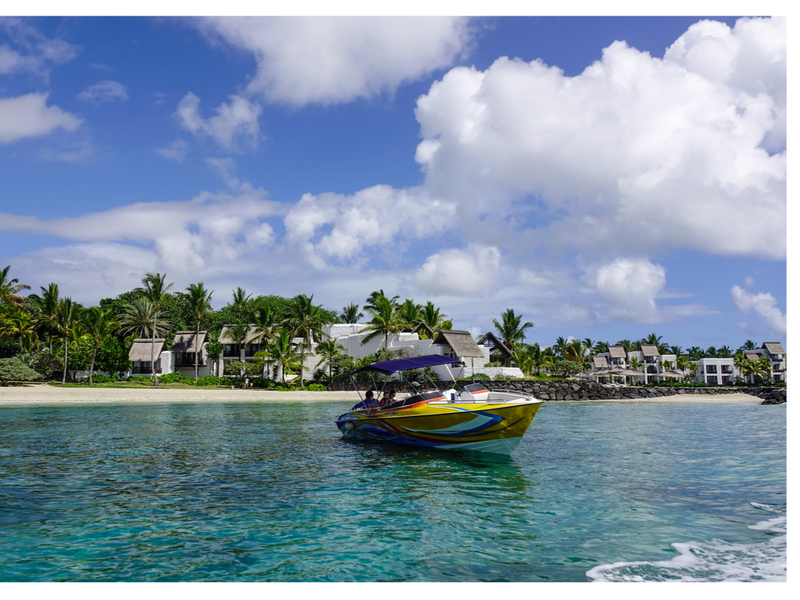 Additionally, most of the Ile aux cerfs tours include drinks and lunch as part of the tour, which makes it even much cheaper and definitely good value for your money. The hassle of transportation can easily rob the fun out of your visit when traveling by yourself. Plus you will probably pay expensive tourists’ price for your lunch. Having said that, here are the three options of our organized tours that you can hop on and enjoy the beautiful sites and activities of the Ile-aux-cerfs Island. This speed boat is designed to offer unforgettable cruising experiences together with your partners, family and friends. As part of the tour, you will get to enjoy the views of the crystal clear water of the beautiful lagoons and the breathtaking scenery that surround them. The tour starts at the Blue Bay Marine Park on glass bottom speedboat in the marine park where you get a chance to swim with the fishes and other marine life. Next, you will hop into the speedboat and visit the shipwreck nearby. We also stop near the Ile-aux-aigrettes –tiny, beautiful coral island, South East of Mauritius. Next, we will stop at Ile-la-Passe and then at Ile-aux-phase. We will also stop at the ile-aux flamants –a bench of coastal sand located in the east –and allow you to take in the beautiful scenery of the romantic side of Mauritius. Finally, we will visit Grand River South East waterfall (vicinity) and then head to Ile-aux-Cerfs Island where barbecue is served with drinks. This tour starts off at, Trou D’Eau Douce, central East of Mauritius. From the shore, you will head towards the crystal water of Ile-aux-cerfs. The boat skipper will pause at an attractive location and allow you to take in the beautiful scenery. We will then take a moment at the Grand River South East waterfalls, located on the longest river in Mauritius. The boat will sail along the canal of the waterfalls for a beautiful view. The wild flora that surrounds this spectacular waterfall is really amazing with monkeys jumping and playing around on trees. Finally, we will head back to Ile-aux-Cerf where finger-licking barbecue is served on the island with drinks. This tour will definitely be one of your major highlights when you visit Mauritius. The tour will take you to the island of Ile aux Cerfs where you will be sailing on crystal clear waters, surrounded by breathtaking scenery and white sand beaches. You get to explore the local marine life and enjoy the delicious food. This tour is all about having true fun and relaxation. The crew members will ensure that you’re enjoying your time –they will be more than happy to tell you about local jokes, tales and play local music that will lift your spirit as you cruise. 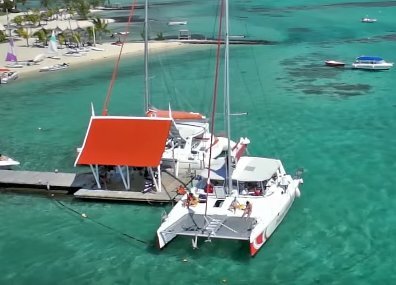 The Catamaran cruise starts from Trou D’Eau Douce, East of Mauritius. The catamaran will cruise towards the Ile-aux-Cerf, with the first stop at the Grand River South East Waterfalls. You will get a chance to view the beautiful scenery of the waterfall and later have a delicious barbeque along with your favorite drink before finally getting to the Ile-aux-Cerfs Island. Once you get on the Ile aux Cerfs Leisure Island, you will have a wide range of ile-aux-cerfs water sport activities to choose from including parasailing, snorkeling, swimming and so on. The island is highly recommended for those who love snorkeling. The coral reef here is beautiful and filled with marine life, making it a perfect snorkeling place if you want to enjoy the views from the rich underwater world. Parasailing is a very common water sports activity on the Ile aux cerfs island. The price is not too high and you can have some adrenaline rush from your visit to the island. After you memorable visit to the Ile aux Cerfs, we will sail back to the Trou D’Eau Douce. both the children and adults entertained during your trip to Mauritius. Combine the activity with Tyrolean circuits, designed with different levels of challenges for a good dose of adrenaline-rush through your veins. 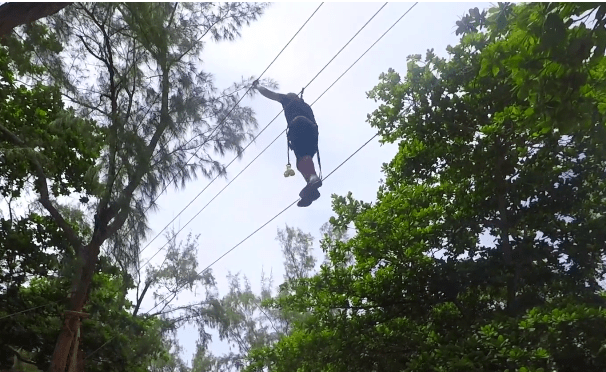 The best thing about zip lining is that you do not need prior experience. •GRSE Waterfall: this spectacular waterfall is located on the Grand River South-East, which is the longest river in Mauritius. The waterfall can be closely accessed using a speed boat. You get to admire the beautiful scenic view of vegetation, land-forms and water. •Blue Bay Marine Park: this beautiful park is located on the South East coast, near Mahebourg. This is one of the best spots to see beautiful marine life and also enjoy snorkeling. Turquoise blue waters contrasting with the white sand beaches provide the best view you will ever have. •Ile aux Aigrettes Island: this is a small island that spans over 25 hectares off the South East coast of Mauritius. The island is currently under conservation and provides breathtaking scenery of South East Mauritius. You also get a glimpse of Mauritian early history. This is a great place to discover animals and plants, found nowhere else –only unique to Mauritius. •L’île aux Flamants: this is a beautiful stretch of coastal land located in the east. The Flamants Island is reputed for being a romantic spot and has charmed thousands of honeymoon couples. •Île de la Passe: this is a rocky islet situated in the Grand Port Bay.